and yanking out its every gnarly white root, and even scraps of leaf that end up scattered (because it will root itself again, from just a torn-off leaf) and hauling the whole mess to the compost. Bishop's weed. Please don't ever plant it. There's a variegated kind, too, which isn't quite as vigorous-- but it's close. This area is contained by lawn, so there is a natural limit to how far the stuff could get. But over by the property line, it has marched its way across several dozen yards of tangled currant bushes, sumac thicket, and tartarian honeysuckle-- would-be fine real estate for Jerusalem artichokes, or ornamental shrubs, or something useful-- were it not for the damn Bishop's weed. The photo above is from Friday, before I launched a sub-nuclear offensive (read: zipped up my rain jacket, made myself hot chocolate in an insulated mug, and got down to WORK). 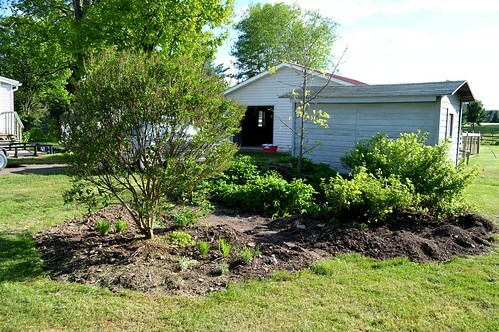 My progress isn't as impressive from this angle, but see here: I hacked, pulled, and dug the stuff out from around the three languishing currant bushes (right side) and denuded that whole left side. I have to say, the thoroughly saturated ground is making the job easier for me, and fueling the progress I've been making this week. I have exciting plans for this space-- come on now, were you surprised? There's a nice Syringa bush there, on the left, and those currant bushes, and a maybe 12 year old hickory sapling, and a giant dead stump (where once there lived a hickory many years older than 12). Between the Syringa and the currants, lined up with the center path in the garden, I'd like to put in a path of wood chips, an efficient energy-link between my kitchen door and the garden gate. You can sort of see the back steps of the house in this picture, on the very left. This little circular area is my pass-through en route to pick dinner, so many nights, and it should suit that purpose. I've already started filling in around the Syringa with a mix of herbs and sun-loving perennials. My priority is things that attract good bugs, and also free or cheap things. Right now, I have Liatris, variegated pineapple mint (I dream of Mojitos...), a few odd Campanulas that caught my eye, an Artemisia, and Anise Hyssop. And chives. The other side gets less sun. My mother-in-law suggested a bench, and the more I think about that idea, the more I like it. A bench under that hickory, backed by a tall stand of Solomon Seal, and flanked by a few fat hostas... yes. Yes, that suits me just fine. 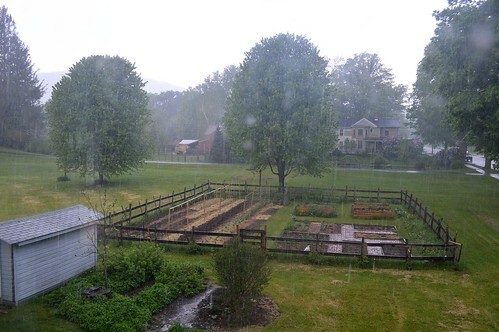 Remember when I had barely an eighth of an acre in which to grow my vegetables and flowers? Remember when my soil was so terrible zucchini failed to thrive? (I never blogged about that.) I remember my old Binghamton life-- that one I left two years ago-- and I feel like a different person entirely, but not on purpose. This place and its needs have changed me, fully, as I hoped it would, and though I have way less time to drink beer on the porch than I used to, and way tougher hands than I used to, this place has been worth it. It continues to be worth it, more and more, every year. Great idea for a perennial/herb garden with a bench! One suggestion...beware of the mint. I planted some about 12-15 years ago and it has become invasive. I can't minimize it as new shoots appear and the mint area grows. I have made some radical efforts to crop it back to a smaller area but the mint won't have it! Beware! Hi Kaity, thanks for your warning about the mint. 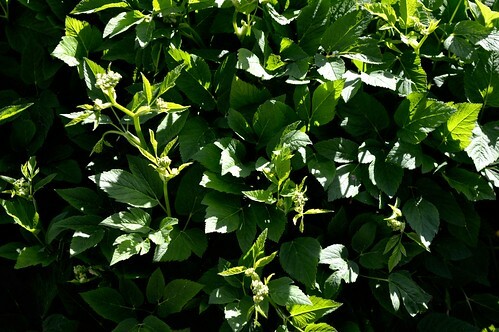 I'm watching it for signs of invasive-ness (some of the ornamental mints are less vigorous) but if it gets out of hand I might dig the whole thing and re-plant it inside a buried flowerpot, to keep it contained. I was gonna suggest a buried flowerpot or something similar for the mint. I love what you are doing - as always. I don't think you have changed, you have simply grown with your new skills and knowledge! P.S. "Scurrilous" is a fabulous and much underused word!! !